Windows Installer can get into a state where it attempts to run on every reboot. There's a free tool that can help clean up Windows Installer. 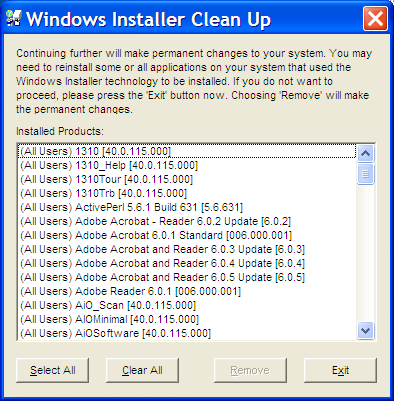 The Windows Installer CleanUp Utility is a free download from the Microsoft support web site. Its job is very, very simple. Caution: its job is simple, but let's be clear about its job before we go any further. It is not an uninstaller. The correct way to uninstall software is to use the Add/Remove programs utility in Control Panel, or the uninstall program that accompanied the software. The Windows Installer CleanUp Utility is a last resort utility for cleaning up issues related to Windows Installer. It does not actually install, or uninstall, any software. These are all various components that the Windows Installer service knows about. Now, backup. First. We're about to make changes to your system, and if something gets screwed up, you'll want to be able to recover, right? In your case, we'll scan the list looking for something that appears to be FAX related, and something that matches any additional clues you might be seeing from the Microsoft Installer messages on your reboot. For example if it's HP Fax software that the installer is looking for, then look for HP Fax related software in the cleanup utility. Once you're certain you've found the right thing ... remove it. Now reboot, and see if that didn't make the problem go away. In many cases if you've selected the correct item it will. If you then actually do want to install or reinstall the software in question, you'll need to start from scratch with a clean install of that particular package. Why do I get "Window Installer, Preparing to install" each time I boot Windows? If you get the "Window Installer, Preparing to install" each time you boot Windows, there are a couple of resources to check out. I get the Windows Installer popping up all over the place when I start a program. I cannot ID whats going on, I cannot stop the process fast enough to see whats actually caused it to pop up. I'd love to use the windows installer cleanup utility, but on what I dont know... my list of apps/progs is just too big for me to ID an orphan one.... I have tried and just cannot see which one it is. Is there a utility to 'log' the activity that appears in the task manager.. so I can narrow it down? or Something else? This solved my problem. Great article and help. LEO.....YOUR A GENIUS! I can't believe I finally got rid of the dam fax.msi. I owe you big time. I've tried everything to get rid of that! My wife said she loves you! I had the same problem. When I cancelled the process it said "canceling" (sic). I find it suspicious a windows process would have a typo. Leo...you are THE MAN! Chalk another one up for "The Leo"! Many thanks! Canceling is not a typo. I am so happy to have this problem fixed. I thought I was the only one with this problem. Thank You so much. This problem has been driving me craaaazy! The Windows Installer Cleanup Utility FIXED IT! You are awesome awesome awesome. Thanks so much! I had the problem exactly as described in the beginning of this article. I downloaded the utility and ran it. I immediately found an entry for "Fax" in the utility window. I removed the entry. I restarted my computer and problem solved. Easy as pie. Thanks to all. I loaded the Utility suggested. When the window appears I do not see anything related to a Fax or Fax program. How do I identify the problem file to uninstall using this utility? "Windows Installer" runs at startup after installing Registry Mechanic. There is no listing in the "Windows Installer Cleanup Utility" for Registry Mechanic. I have tried installing and uninstalling Registry Mechanic several times. says, "It does not actually install, or uninstall, any software." I don't know who to believe and I don't want to start guessing and have to reinstall all of my programs if I use the cleanup utility. There is no reference in my pop up window as to what program is being installed. In the old DOS, you could step through the startup process. Is there a similar command to start windows XP? If I could figure out what program is trying to be installed, I could remove it. I ran the windows installer cleanup, but it talked about having to reinstall all the programs that had been installed with windows installer, so I didn't want to unload the wrong one(s). Remove Kaspersky (If you have), remove all kaspersky related files, folders, databases, setting files, just everything on kaspersky. It is worked on my computer. HP software will cause this a lot. I see "photogallery" as the problem most of the time, and since no one keeps their HP CDs, I just kill any process starting with "hp", then go into this utility and get rid of photogallery (or whichever app is trying to install itself), and everything works again. OH MAN thanx! It worked for me too! I never thought that this utility program from Microsoft exist until I read your article. I have problem with my snagit installation, where every reboot it will try to install again. I have deleted the folder, clean up the registry, using the windows clean-up. But nothing help. any ideas? BEWARE of registry mechanic. I used it for a long time till it became the cause of the dreaded blue screen. the result total reinsatall of XP pro along with the long long reinstall of all updates. I emailed Reg Mech under my subscription for help but they did not even respond to any messages. They took my money and ran. So why all the praise? I also had the problem of Windows XP Installer coming up on restart and asking for the file "fax.msi" on both my PC's. I have an all-in-one HP 2610 printer. Problem started with Iolo System Mechanic 8.0; specifically the Registry Cleaners/Defragmenters. Leo's suggestion of Windows Installer Cleanup Utility aka. "mscicuu2.exe" doesn't even run as his screen prints show. I ran that program and... nothing. The screen just sat there as if I clicked nothing. Take out your registry "cleaner" and reinstall your HP printer software and don't use registry cleanup/ defrag software. I still use System Mechanic 8.0 on both PC's, but not the registry tools. 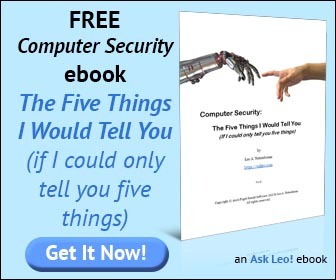 Leo's suggestion did not work in my case, yours may be different. This seems applicable so I'll try it, but I am not sure. Cookie Spook, an application that eats some cookies, I once had on my system. Well, I installed it from time to time, and uninstalled, it. Now, every time I run Firefox or restart the computer, or just about anything, Cookie Spook tries to install. Yes I have deleted all of it from the system, even using the Revo uninstaller, and have no idea how the installer that doesn't exist is running, to then not find a component in the folder the installer was in....I think it should just come up with a banner "welcome to Microsoft's version of a product ready for sale to the public" as that seems more appropriate to so many of these errors, many of which have been here since windows 95, 98, etc. I'd buy 7 if not for Vista and this type of ongoing error from 95 to XP. I have little faith in issues being fixed that seem to persist even when Microsoft revamps the engine. Let me ask this question? Is it HP that is at fault when Windows Installer tries to install �fax.msi� at each start up and reboot or is it Microsoft? I run Windows XP Home and this problem started when someone stupidly installed Service pack 3. Not only did this damage my Office 2000 Pro but also initiated this Windows Installer �fax.msi� nightmare! I find HP printer software to be insidious, a disease, cancer to computers. I had a 5700 loaded at first but then I got rid of that printer and installed a simple 1500. I found that HP covertly loaded other software such as �customer participation� program at 270 MB along with some other cancerous software. So, is this "fax.msi" problem an HP disease or Microsoft? I still don't see any solution to my problem of what to do when the Fax msi installation thing keeps appearing every time I reboot. I need some personal help, please. Do I need to download one of the Fax free trial pacs? Some of you have posted that the "mscicuu2.exe" does not work like Leo posted. That would be because that file is now part of the Office 2010 installation and Microsoft has discontinued the Installation Cleanup Utility program altogether. Their latest suggestion is to contact the software manufacturer for help and any reference to the "mscicuu2.exe" file on Microsoft's support site sends you to a KB article about Office products.